Potato pie really is the ultimate comfort food for me. They are absolutely delicious and sit in your belly like a warm lump of happiness. A pizza place back in my home town makes them and though I can’t duplicate their phenomenal pies exactly, mine do come fairly close. Don’t be put off by the purple color. 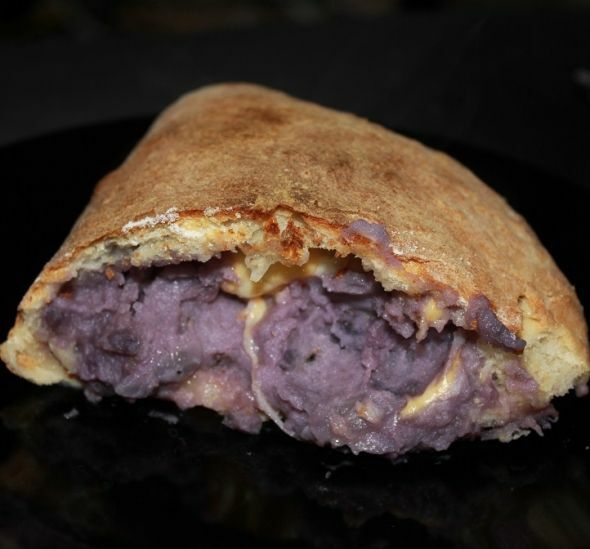 The last batch I made (photographed) just happened to be made from purple potatoes because my husband brought them home one day to try and suggested I make some potato pies. Below I’ve detailed the step by step process that I use to make my potato pies. Hopefully with each batch I’ll get a little closer to capturing that elusive home flavor. 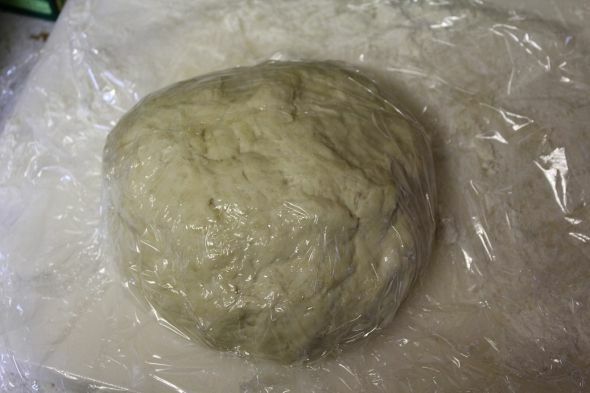 The first thing you need to do (unless you’re taking a much welcome shortcut) is make the dough. 1. 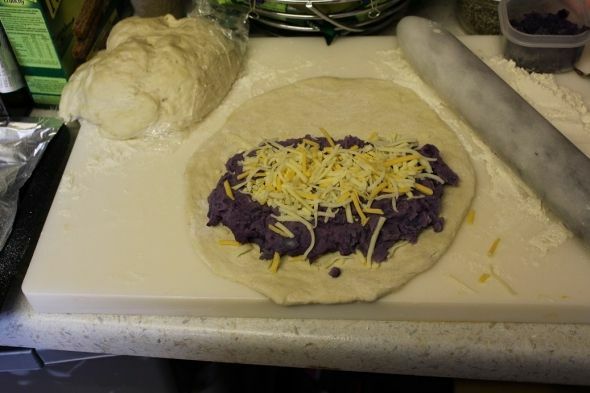 The dough for a potato pie is pizza dough, plain and simple. 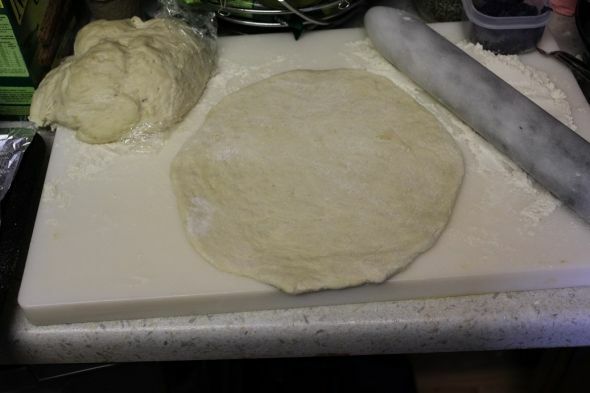 So you can use a premade pizza dough or you can buy a pizza crust mix if you wish, however I strongly recommend that you get some garlic infused olive oil into the dough if you take a shortcut because it really enhances the flavor of the whole pie. 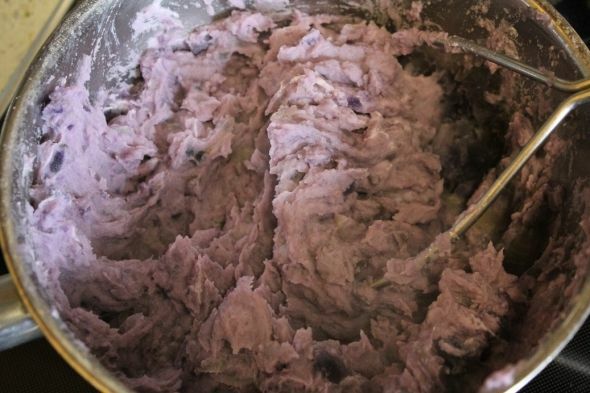 If you want to make the dough yourself you will need to combine the sugar and yeast with warm water. Make sure everything is dissolved and leave the mixture to bubble away in a warm place for about 10 minutes. Once the yeast has frothed up you’ll add the mixture to the flour and pour in the garlic infused olive oil. Next knead the dough for 10-15 minutes with a bit of extra flour if the dough is too sticky. 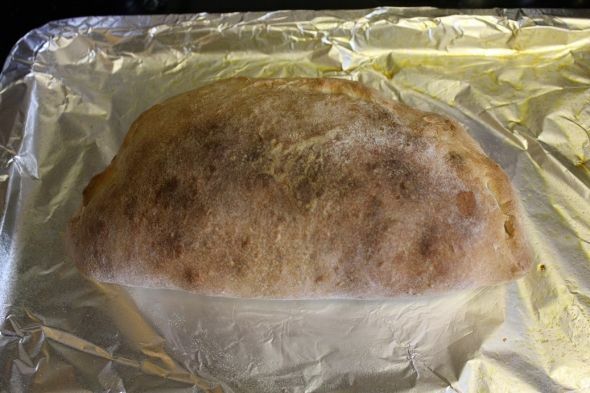 Cover the dough ball with some plastic wrap and leave it to rise in a warm place (preferably inside a bowl) for 30 minutes. 2. While the dough is rising, peel and wash the potatoes and then chop them up into even cubes. 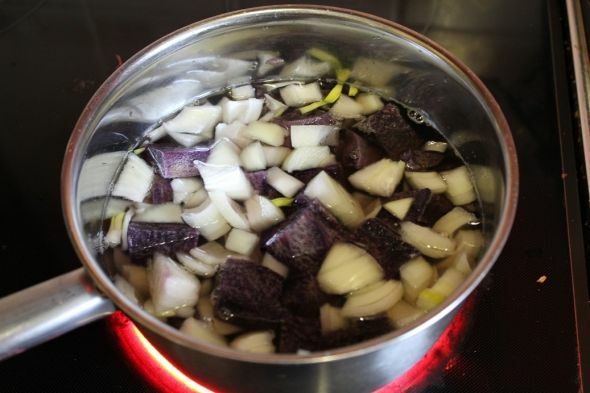 Chop the onion as well and toss into a pot with enough water to barely cover the top of the onions and potatoes. Boil until they are tender enough to mash and strain the water away. 4. After the dough is ready and the filling is assembled, it is time to fill the pies. You can make these pies as large or as small as you like. For this batch I made one pie with 1/3 of the dough (pictured) and then I made a long skinny pie with the rest that I cut into segments and snacked on for two days. For the sake of this recipe let’s just say we’re going to make 4 equally sized pies because that would be approximately a portion size for someone who was eating one pie as a whole meal. 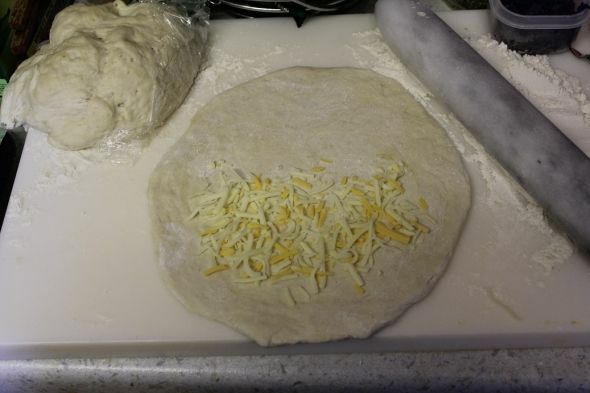 So based on the 1/4 theory you’ll be rolling out 1/4 of the dough with a rolling pin and then filling it as in the photos below, layered with grated cheese. 5. I have discovered that the best way to seal one of these pies is not actually the way that I have pictured here. The best way is to bring the free end of the dough over to the edge of the filling on the other side and then press the dough together toward the counter top with your fingers. then you can trim away the excess. What I did in the photo was instead of trimming away the excess i folded it up which just made a big fat, unnecessary crust. It’s up to you how you do it, just be sure that those edges get sealed one way or another and then pop the whole thing onto a greased baking sheet. 6. 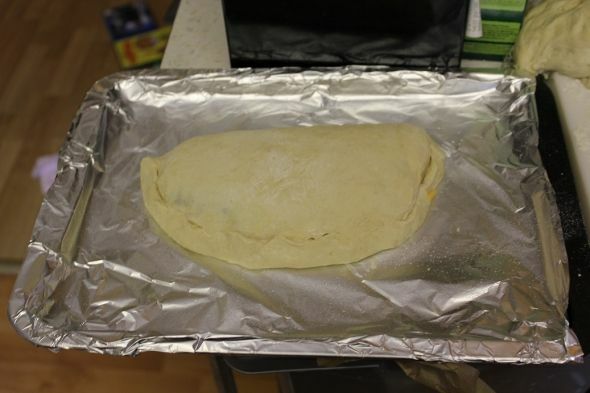 Preheat the oven to 180c or 350f and bake the pie for about 20-30 minutes until it’s nice and crusty and brown.